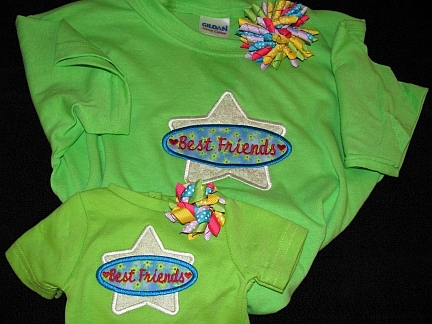 Your little girl & her doll will look adorable wearing these matching Best Friends T-shirts. Available in lime green & feature a darling white with gold glitter appliqued star behind an appliqued floral oval. Youth sizes Small--Extra-Large. The matching korker bows ship free when ordered with the shirts.